Along with the release of the third generation Hypervenom series, Nike has changed the naming convention for the top tier boots. Rather than the collar version being Phantom and then the top tier ankle cut being the Hypervenom Phinish, they have simplified things and gone with Phantom DF and Phantom. 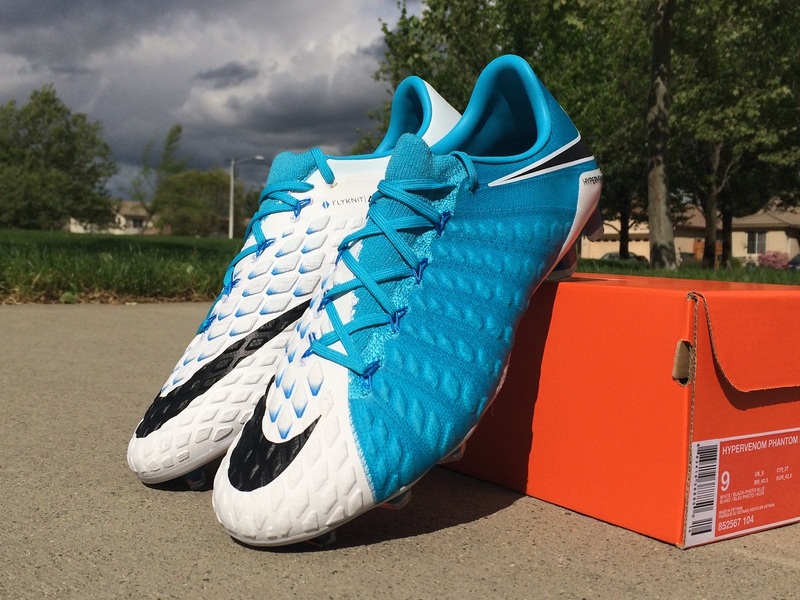 As a result, that would make the above version the Hypervenom Phantom III. The colorway, Photo Blue/Chlorine Blue/White, joins the Motion Blur pack and makes for an ideal spring boot design. Why the naming change? 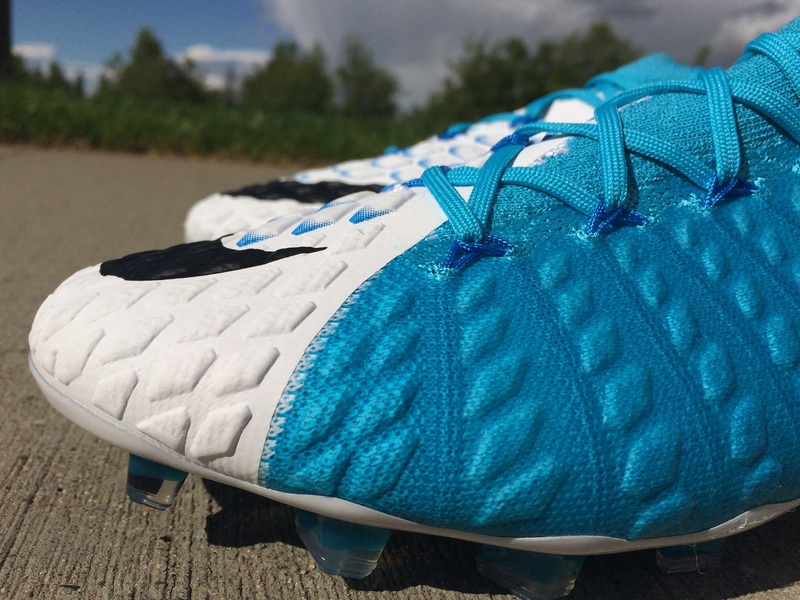 Well, this is the first time where Nike use a complete Flyknit upper on the top-tier Hypervenom boots. And both the Phantom DF and Phantom are pretty identical minus the all important mid cut collar. 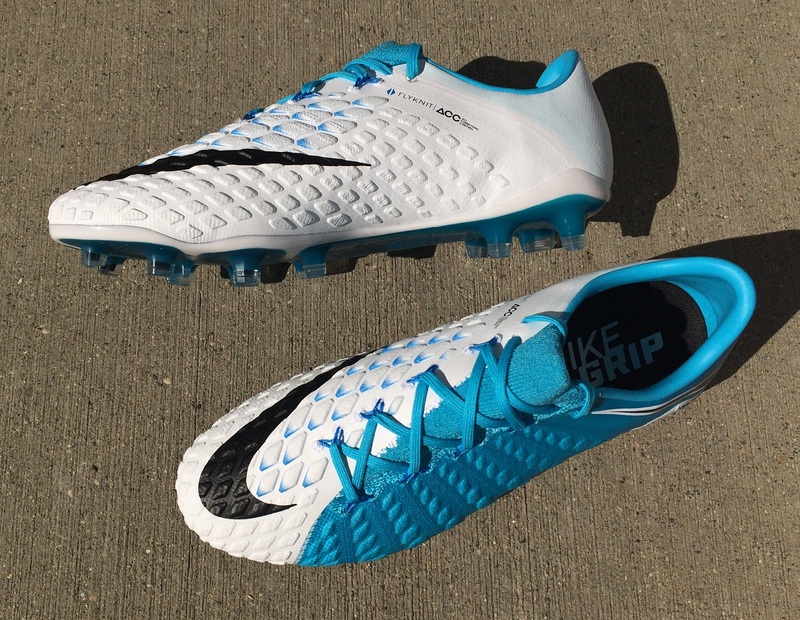 The move to Flyknit is extremely positive and it is one of the elements that makes it such a more dynamic boot. The upper has a pliable feel thanks to the knit structure, with ACC (All Conditions Control) placed on top to help give structure to the material. You need the ACC to keep the material shape, ensuring it has a more durable lifespan. 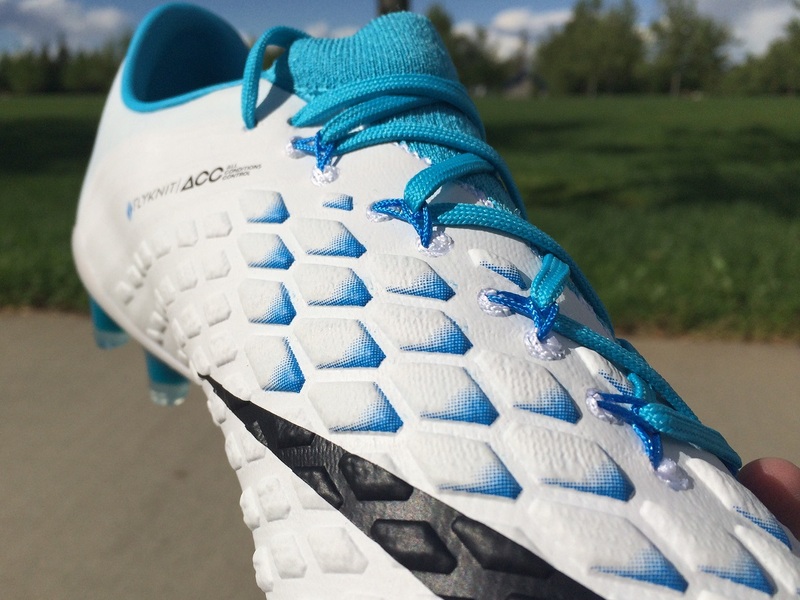 Looking at the laces, you will notice that they actually run through thin, doubled-up wires rather than actually cutting into the upper of the boot. 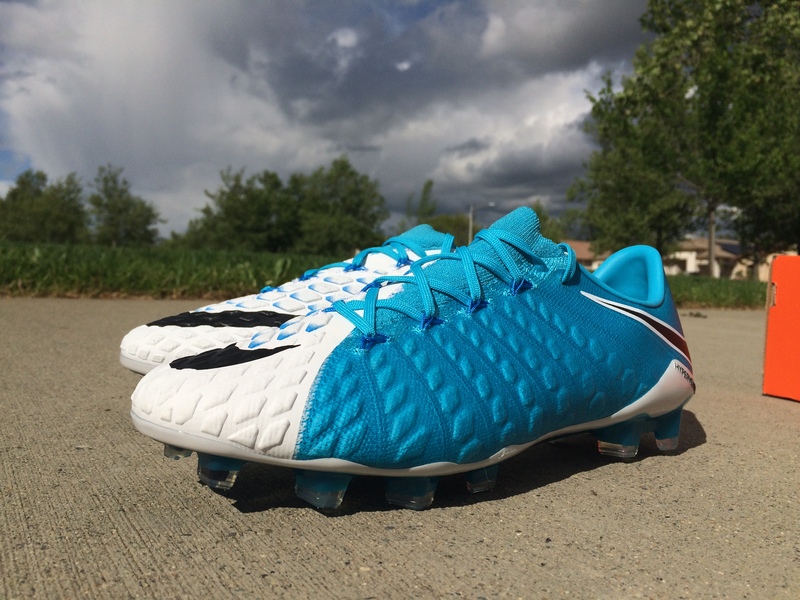 In similar fashion to previous models, the Flywire runs through channels in the upper right down around the sole. What is different about the Hypervenom 3 is the fact that you actually get to dictate how tight you wear the boots thanks to the laces pulling the Flywire in around your foot. f any aspect of this boot makes it a strikers boot, it us the all important strike zone. Without actually employing it, the modifications to the upper has elevated this release into the power category, a category we haven’t seen Nike in since the retirement of the T90 Laser series. What they have done is lined the strike zone with PORON foam pods, which harden on impact to create a firmer and more responsive shot. I’ve got to say, they work an absolute treat. Nike has been strategic with the placement of the PORON foam pods, keeping them out of areas where you are taking lighter touches on the ball. As a result, you do get a very natural feel as you move with the ball at your feet, or take control of a short pass. But when you strike shots, the PORON foam pods act beautifully and reduce the amount of impact you feel while adding a little extra rebound. So, just to reiterate again; there isn’t a while lot different between the Phatnom DF and the Phantom other than the dynamic fit collar. Depending on your preference, players can go with a more controlled fit via the collar or keep this independent with a regular ankle cut. 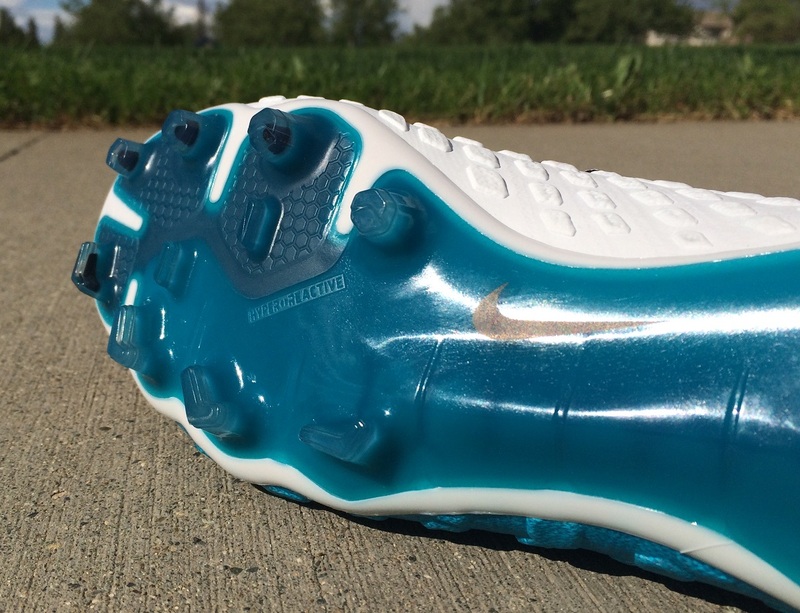 The upper and soleplate offers via similar traits and the level of performance is right on par. 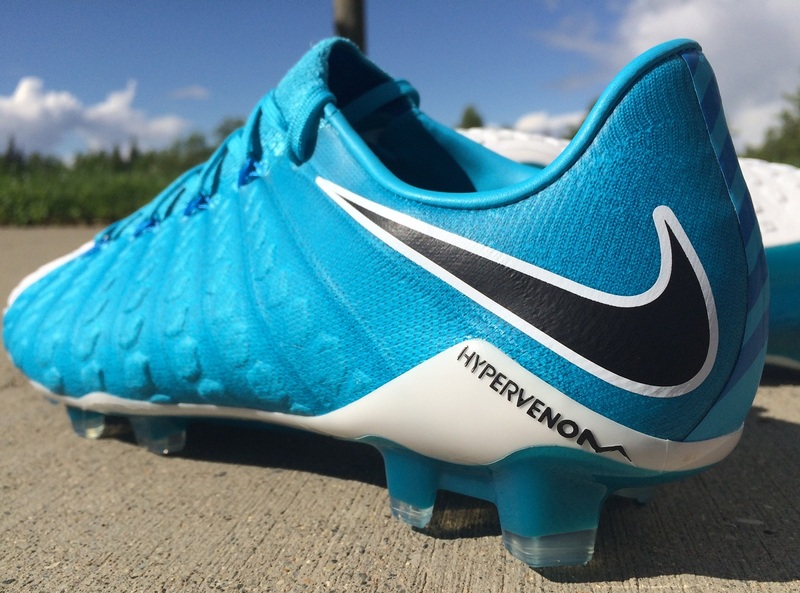 You can find the Hypervenom “Motion Blur” available at soccer.com.